Seems like every day I get an email from someone who is hyping up their new app or new tool. I usually look at them all, but the ones that rise to the top are ones I’ve been using for a while. When it comes to Twitter, there are a couple I can’t live without. Hootsuite. Buffer. A new app called Swayy I’m getting into. And, until recently, Crowdbooster. Crowdbooster recently went from free to paid. 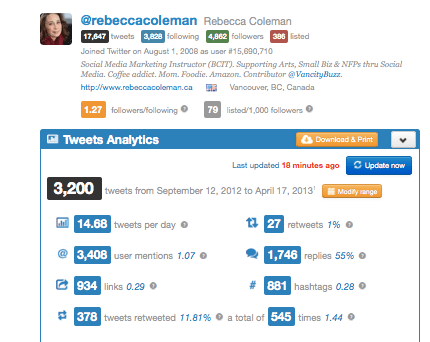 Another app I’ve just discovered, and, for me, is helping to fill the void left when I left Crowdbooster, is Twitonomy. It has some pretty great features: analytics, breaking down your tweets and showing you how you are doing with re-tweets and @mentions. It shows you the people you connect most with, and how your tweets are doing. Even what times of the day you most often tweet, and which of your tweets have gotten the most retweets! It’s really great. My favorite thing about Twitonomy is that you don’t have to have access to someone’s twitter account to analyze it. You wanna check out your competition?? Just put their Twitter handle in the little box, and they’ll analyze it for you! Pretty cool, hey? It’s a great little tool. Get an account and play around with it!